Literally. With a temperature of 29 degrees Celsius around this period of the year, the weather is a welcome relief if you were arriving Singapore from a very chilly London like I was in the second week of December this year. I would be reminded of recent warmth a few days later of course, with temperatures in the low teens in the capital city of that great island English nation. As I couldn’t immediately hit town upon my arrival due to an academic engagement the following day, I had to make do with sights I saw on my way to the hotel from Changi International Airport. Fortunately, I was scheduled to present my paper and discuss another one both on the first day of the 2-day conference. So I had a full day to explore the city before returning to London the following day. Although 24 hours may not seem like enough time to explore a city, City Sightseeing Singapore makes it possible for you to get a sense of the city if you are time constrained like I was. And it is relatively cheap. Fortunately it was a bright and sunny Saturday. Well, at least until 3pm thereabout when the heavens poured rain. The remainder of the day thereafter was wet. But no matter, that period of the day was spent window-shopping from one mall to another connected by underpasses on Orchard Road. If you have money in your pocket, you are likely to spend it once you get into any of those underpasses. And you must pass through them. The Singaporeans make sure of that. If you were walking on Orchard Road towards the Ion Orchard mall for instance, you have to cross over Paterson Road, which intersects Orchard Road from the side I was walking from. As the road is fenced on both sides at the intersection, you couldn’t just cross. Instead, you either went down the underpass or crossed towards the other side of Orchard road and then over another intersecting road (Scotts Road) before continuing onwards. But you’d still have to walk further down and even then, the only way into the malls on the other side is down an underpass. Thus, if you were just planning to cross the road through the underpass, think again. The shops are situated just along where you must pass through. And because there are so many people trying to get through, you end up thinking may be you should take a break in one of the shops. So, if you have one of those plastic cards, hmmn. You will spend. I can guarantee that. The other major shopping district, which starts at the end of Orchard Road, is also where the iconic landmarks of Singapore are situated. At least the ones, I was keen on seeing. Encircling the Marina Bay are shopping malls, the Art Science Museum, the Singapore Flyer (largest observation Ferris wheel in the world), Gardens by the Bay et cetera. Developments around the Marina Bay are such that, you could live and work in the area without having to go anywhere else within the City. And trust the Banks to congregate their offices in the area. 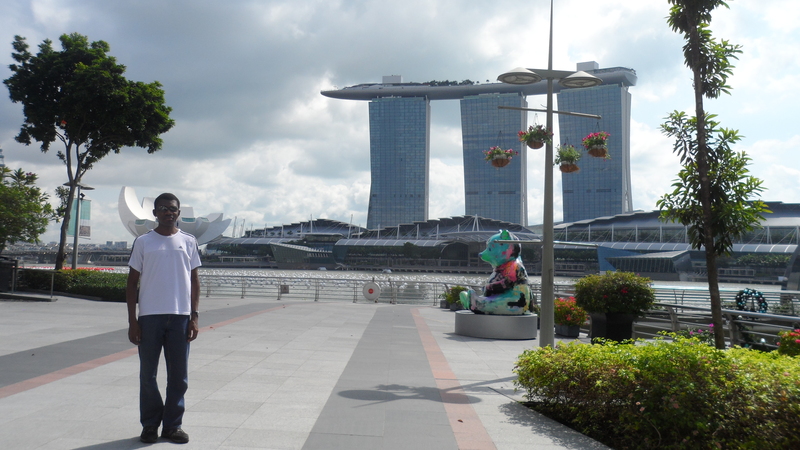 The skyline of Marina Bay is filled with the branded buildings of major international financial institutions. While still at Nanyang Business School, the venue of the conference I was attending, I struck a conversation with a Singaporean student who was volunteering at the event. I wanted to know how wealthy he felt. Singapore after all has one of the highest GDP per capita in the world. The gentleman thought he was not as wealthy as the average Singaporean. His sentiment caught me by surprise. Surely, if he was attending a top business school like NBS, he couldn’t be poor? So I asked the same question again but now as a series of questions. Do you have cable TV? Do your parents rent or own the house they live in? Is any Singaporean able to attend NBS if they are accepted? His answers to these questions were in the affirmative. The “poor” guy was probably thinking about quite a number of his contemporaries driving their Ferraris and Lamborghinis with little care on the major streets of Singapore; a sign of intergenerational wealth. For a highly priced education (attending NBS for instance), the government provides financial assistance he would tell me. But the fundamental test for me of whether a country is wealthy is the proportion of its citizens that own their own homes. 90% of Singaporeans own their own homes, according to figures from the National Population and Talent Division (NPTD) in September this year. On average, these homes are 4-room flats. That should give you an indication of how “poor” my Singaporean friend really was! Inevitably, I kept comparing Singapore with Malaysia, the country that it gained independence from in 1965. Singapore being a city-state, a fair comparison would be with Kuala Lumpur, the capital city of Malaysia. One of my regrets when I visited Kuala Lumpur in 2011 was not being able to visit Singapore just an hour away. Africans face many constraints when they travel round the world. To have tried securing a visa then to see the neighbouring city would have been a little distracting. It would take another 3 years before I’d finally get the chance. But of course, being a Muslim, you know if you were destined for something, all of the World would not suffice to stop you. So, a lesson there. Kuala Lumpur is smaller and slower-paced (according to my ‘friend’ who has a relative in Malaysia). Maybe I liked Kuala Lumpur better in spite of all these because it is predominantly Muslim. But there are lots of Malaysians and Muslims in Singapore. In fact, I got to meet my Singaporean friend because I was looking for where to say my prayers at the Business School. And he is not a Muslim. The mosque it turns out is situated on top of the Dean’s office. Ha! But then I stayed in Kuala Lumpur longer, some 4-5 weeks if my recollection is correct. It is likely I would like Singapore more had I stayed as long as well. Based on the facts, however, they are not comparable. On my 13-hour flight back to London, I did ponder how one spurned could still come out on top – Malaysia expelled Singapore from its Federation in 1965, just two years after joining. And today, Singapore is five times (5x) richer on a GDP per capita basis. A timely and valuable lesson for a young man still trying to find his way in the World. This entry was posted in Travel and tagged Africa, Singapore, Travel on December 16, 2014 by rafiqraji. Ethiopians love their coffee. Well, I love coffee as well. I’ve recently had to cut back on my intake – apparently drinking too much coffee could be problematic for the digestive system. Too late. However, I’m skeptical that caution would apply to Ethiopian coffee. At least, not the coffee I drank during my first visit to the country in late 2013. That caffeine kick you get when you drink instant coffee is an intrusion, I think. You drink Ethiopian coffee (got another chance in London at the Africa Utopia food market in September 2014); you don’t feel any of that. Instead, your senses are enlivened by the aroma, taste and smoothness of the coffee. At least mine were. And since one drank a lot of awful instant coffee most of the time, believe me it was not too difficult to tell the difference. You drink it and you want to know how much it had journeyed to finally make it to your cup. You want another cup, and then another cup; until afterwards you say maybe I should stop now. But it certainly wouldn’t be because you fear the coffee would burn a hole in your stomach. Ethiopians take their coffee seriously. And whether you are rich or poor, it is the same coffee. On holiday and being in Ethiopia for the first time in late 2013, I was curious. First of all, I wanted to know how they’d manage to do so well with their national airline unlike a lot of other African countries. Well, how do you get a feel for that? Well, you fly the airline. So I did. Once in Addis Ababa, I took my time to survey the airport. The Bole International Airport is functional. The first thought that came to my mind was: Chinese. The Shanghai and Beijing international airports are not extravagant. They are simply functional and efficient. Bole was built by the Chinese. You could tell instantly. One thing I did observe was the caution around foreign exchange. One was able to procure goods and services in the convertible foreign currencies quite easily. To acquire foreign currency (to convert your Birrs to US dollars, say), however, you had to go to a bank. You could also change currencies both ways at any of the international hotel chains. Since I was also attending The African High-Growth Markets Summit organized by The Economist at one of them, I made enquiries. Yes, you could. But at the smaller and less pricey ones, you get your change in Birrs. At least, that was my experience at the hotel I stayed at. As you can imagine, I was on a budget. When paying my hotel (not an international chain) bills, the receptionist gave me change in Birrs for my US dollars. On the road to the hotel, I kept trying to benchmark the size of the city with other African cities I had been in. Nigeria’s northwestern city of Kaduna was the closest city I could think of that compared with Addis. But Addis is a much more international city than Kaduna. 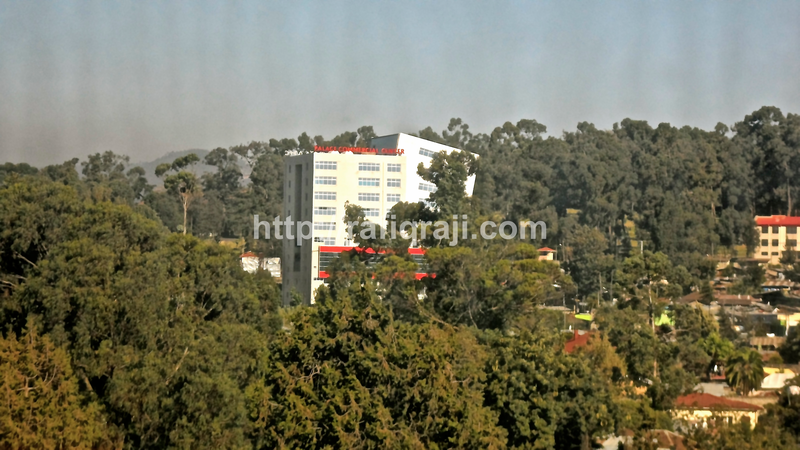 The African Union, United Nations and a myriad of other multilateral agencies and NGOs have made Addis their home. It is somewhat of a paradox that a supposedly “closed” country would be host to so many international agencies (and many international conferences) on the African continent. First thing I did when I got to the hotel was to pick up the local newspapers at the lobby. There is just no way you can get a feel for a country without actually going there, meet its people and get a feel for what makes the country tick. The other thing I try do when I visit a city – not that I’ve visited many – for the first time (and even subsequently) is go for a walk/jog around the city centre. There is a lot that you miss if you try to get a feel for a city from behind the windows of a car. You have to breathe the air. You have to lock gazes with the locals. You have to get into conversations with them. Even make a few mistakes. For instance, I thought the ornate surroundings of this particular compound was worthy of a photo. Well, in no time, the guards came out from their watching posts and wondered why I was taking a photo. Unbeknownst to me, it was an official residence. I did think though the surroundings were eerily calm. It was so for a reason. I was not too eager to take out my camera afterwards though. My caution was unnecessary. Soon enough, I’d see other tourists clicking away. Unlike most of them, however, I didn’t get a chance to see the hinterland. Not that I’d planned to do much spending on this trip. I was on a budget, remember. I did acquire some books on Ethiopia that I doubt you’d find readily elsewhere. But there was a lot of sightseeing I didn’t get to do. For instance, Abyssinia (in today’s Ethiopia) is of great importance to Muslims. The first set of Muslims to flee persecution in Makkah (in then pagan Arabia) found refuge in Abyssinia and were settled in Negash (northern part of today’s Ethiopia) by King Armah (“Ashama ibn Abjar” in the Arabic tradition) of Axum. As a Muslim, I would have loved to visit (still do) where they were buried. Time and money were constraints. I also didn’t get to visit any of the nine World Heritage Sites in the country. The stone castles of Gondar, rock-hewn churches at Lalibela, and Lake Tana monasteries are marvels I’m told. The country’s high mountains – some over 4,500 metres high – are also breathtaking, I gather. These are sites I’d certainly like to visit on my next trip, which I hope would be some time soon. I’d definitely like to travel the so-called Historic Circuit, which includes some of the above-mentioned sites and more. I did enjoy my walk through the city though; often a round trip that started on Tito street where my hotel was located, through Menelik II Avenue, Taitu street and Yohanis Street and then back on Tito street. It was also surprisingly (for me) cold at night. I visited during the dry season, usually between October and May. Although it was chilly in London at that time of the year, I was a little surprised I had to hang on to my jacket at night the entire time. As you can imagine, I didn’t get to see a lot of the many sites I would have loved to see. Having happened on quite some time lately, you wish you could move time and money to coincide with a travel opportunity. And even when that happens, you want to go somewhere different. The lesson I’ve learnt, however, is to make sure to be more exploring of the cities I travel to. So the next Ethiopian trip – though likely more adventurous – would have to wait. But then coffee is best-enjoyed one slow sip at a time! This entry was posted in Africa, Travel and tagged Africa, Ethiopia, Travel on December 8, 2014 by rafiqraji.